This summer kids brought Dollar Dog on vacation to great places like Yellowstone, the Pentagon, Mt. Rainier, Las Vegas, Kansas, Utah and more. 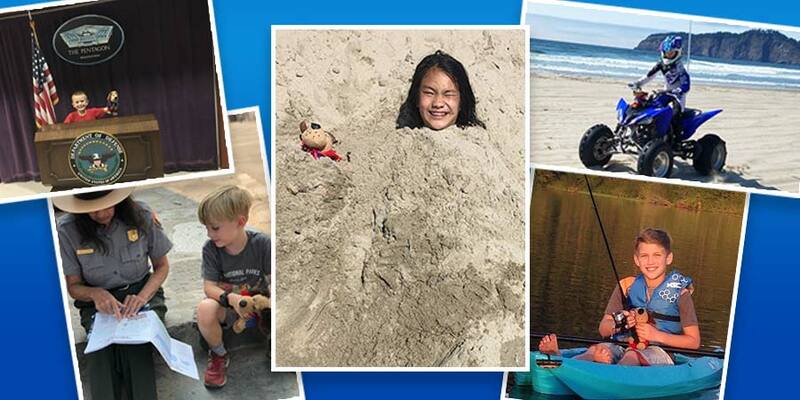 After returning home they entered their photo and a brief description of their adventures in our Dollar Dog On Vacation Contest for a chance to win a $250 Visa gift card and other prizes. The competition was intense with 65 entries. Below are our top five contest winners. When I was in Santa Monica, California at the beach, I got buried in the sand by my mom. Then I decided that it would be a good idea to have Dollar Dog also buried next to me too. Getting buried in the sand is super fun and better than getting wet and dunked in waves! Traveled with Dollar Dog to the Pentagon, Washington D.C.
Dollar Dog has been very busy this Summer! He was exploring D.C. and he got a special invitation to tour the Pentagon! We all had a ton of fun! Dollar Dog helped me complete my junior ranger book at Crater Lake. Then we got our badge with my cousins. "Dollar Dog Racing." Tyler strapped him to his ATV and off they went.... Later he decided they wanted MUCH more power, so he swiped my quad LOL. This summer I worked at my Grandparents house and earned enough money to buy a kayak and fishing pole. I enjoyed going out on the lake almost every weekend and fishing for trout with my Dollar Dog. Now I'm trying to save enough money to get my piano tuned.